When I was a teenager, I had an ice cream soda flower! 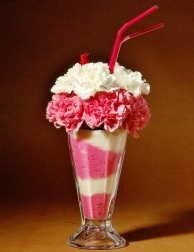 The glass vase was filled with soft fluffy pink "soda" and faux pink carnations represented the ice cream, while a straw, plastic cherry and other bits and pieces stuck out above the flowers creating a fun representation of an ice cream soda. This flower arrangement was special and important to me because it was a gift from my Grandma. For many years, I took great care of this novelty - giving it a prominent spot on display in my teenage bedroom and then later in my first homes as a young adult, removing all the pieces and dusting each one carefully from time to time, reassembling all the bits and pieces to create the perfect ice cream soda illusion. However, eventually the beauty of the piece began to fade as the fluffy "soda" became crushed and dirty, the straw got bent, and the carnations began to whiten and discolor. At some point, I threw out all the decorative pieces and just kept the glass vase, which must have eventually been given away or broken. While I have no longer have this fun piece, I still have the memories of what it represented - Grandma's love and the feelings of specialness her gifts evoked in me. Just like those carnations, we find many allusions in the Bible to flowers that fade. Yet we also have the reminder that God's love never fails (1 Corinthians 13:8) and that His Word stands forever (1 Peter 1:25). Have you ever wondered about the flowers mentioned in the Bible? What do they represent? What can we learn from them? Will considering the lilies really help us worry less? We'll be discussing these questions (and learning a variety of flowery illustrating techniques) in my upcoming Bible journaling class here in Allen, Texas, on May 10 and 11 - check out all the details below! Join me in May as we discuss the flowers mentioned in the Bible and enjoy time illustrating what we learn using a variety of flowery techniques. Please note: If you receive a notification that the class is sold out & would like to be added to the waiting list, please email me. If you are registered and unable to attend, please let me know before May 6 for a full refund or transfer of fees to a future class. Cancellations after May 5 are nonrefundable; however, I will be happy to mail you the class kit. Such lovely memories. Nicely tied from your Grandma's gift to the flowers to the workshop.